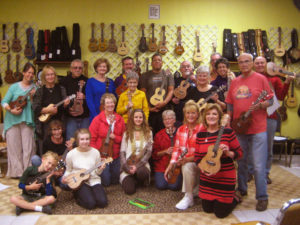 We LOVE our Beginner Ukulele Students! Jeff Hanna, co-owner of the The Rhythm Inlet & steward of the ukuleles at The Ukulele Place, combines his masterful teaching style, a background in singing & performing in small a-cappella groups, & a love of rhythm, strumming, singing & humming a tune on the ukulele, making this class fun & super accessible to even the rawest of beginners. Promise! Learn & review a few simple chords & find yourself strumming easy, great popular songs you already enjoy singing along to. By hour’s end you’ll be making music with your classmates, humming a happy tune on your ride home. I’ve heard the ukulele is on its 3rd renaissance. I don’t know if the first 2 were global, but this one sure is. Catch ukulele fever, it’s one bug that’ll make you smile. No musical experience or ability to read music needed. We have 200 ukes on the wall available for class use or purchase, or you can bring your own uke. Pre-registration is required; limited space! Cost is $120 for 2 months of weekly classes. Ask about your included 2-Month Membership! Wanna check it out to see if it’s right for you? Register for the first class at $15 in advance or $20 the day of. Your tuition balance is due before you leave after class. Total price remains the same. Join the Facebook Event Page for this class. Join the Meetup Event Page for this class.